You will earn 3,119 Reward Points. Earn 1 reward point for every 1 dollar spent. Compact Design With Up To 20 Tray Capacity. Redesigned long life door latch. Heavy-duty stainless steel stem casters. Door conveniently opens 270° out of your way. Stainless steel construction provides years of service life. Models 640-657 are available in standard dark mahogany vinyl exterior. Double door models available for loading and unloading from either side. Models for 14” x 18” (356 x 457) or 15” x 20” (381 x 508) trays with ample 6” (152) ledge spacing. 16 or 20 tray capacity. 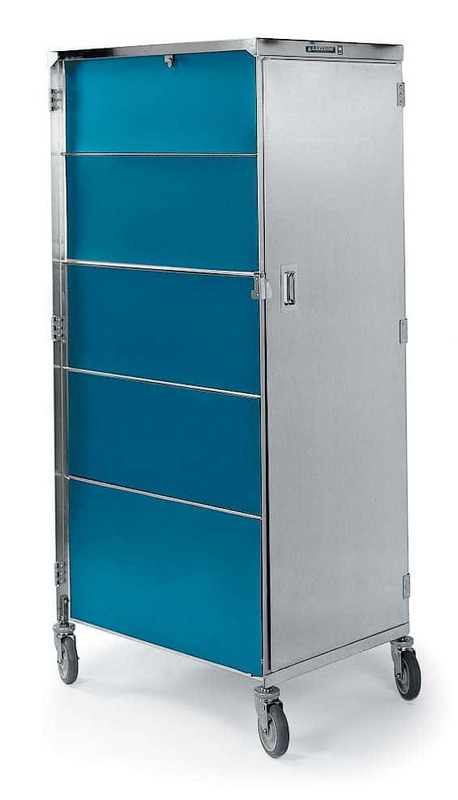 Unit shall be of fully welded Type 304 stainless steel construction and shall accommodate either 14” x 18” (356 x 457 mm) or 15” x 20” (381 x 508 mm) meal trays. Unit back, top and sides shall be of 18- gauge stainless steel. Compartment floor shall be of 22-gauge stainless steel. Tray ledges shall be of .104 x 1" strip stainless steel. Ledges shall have 6" (152 mm) spacing and shall accommodate two trays per level. Door(s) shall be of 22-gauge double pan stainless steel, with 1" (25 mm) polystyrene insulation for sound deadening and shall have spring-loaded swing type latch. Door(s) shall swing open 270° and shall lock in an open position. Casters shall be stainless steel corner mounted stem type 5” (127 mm) diameter swivel, with shielded bearing and non-marking polyurethane wheels. Unit shall be NSF listed. Model 640 and 650 Series only: Exterior sides and door(s) shall have decorative wood grain or solid teal vinyl applied over stainless steel.